(i) Write the digits of the given numbers one below the other such that all the decimal points are in the same vertical line. (ii) Add as we add whole numbers. 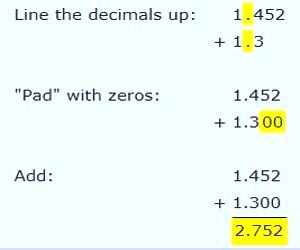 (iii) Put the decimal point of the sum vertically below the other decimal points. 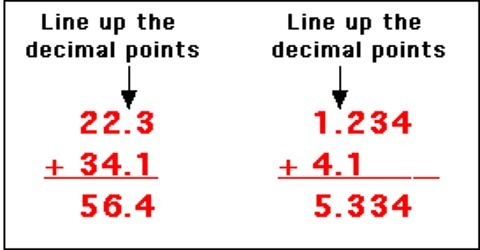 Then add using column addition, remembering to put the decimal point in the answer. Problem 2: Subtracting: To subtract, follow the same method: line up the decimals, then subtract. 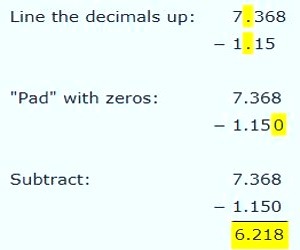 Example: What is 7.368 − 1.15?